For example a cube is a Platonic Solid because each side is made of an identical square and three squares meet at each corner. 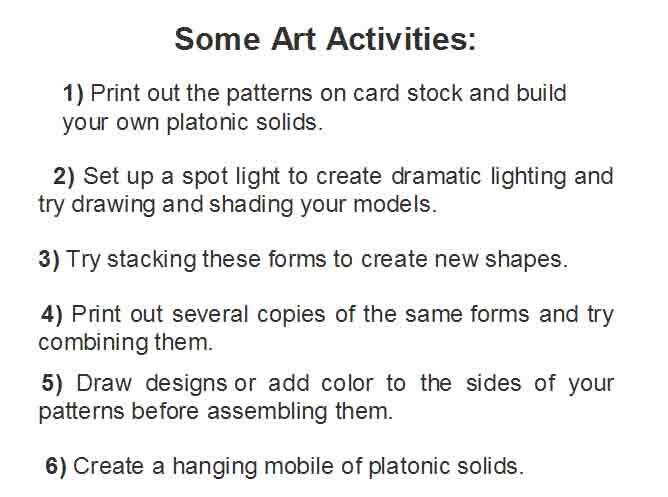 Design your own polyhedron by printing out and combining the geometry nets (paper patterns) above. 7) click here to find out how you can build a three-dimensional dodecahedron tessellation. 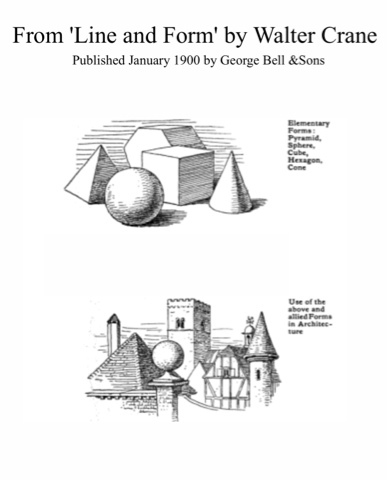 Can you design and build tessellations out of the other platonic solids? 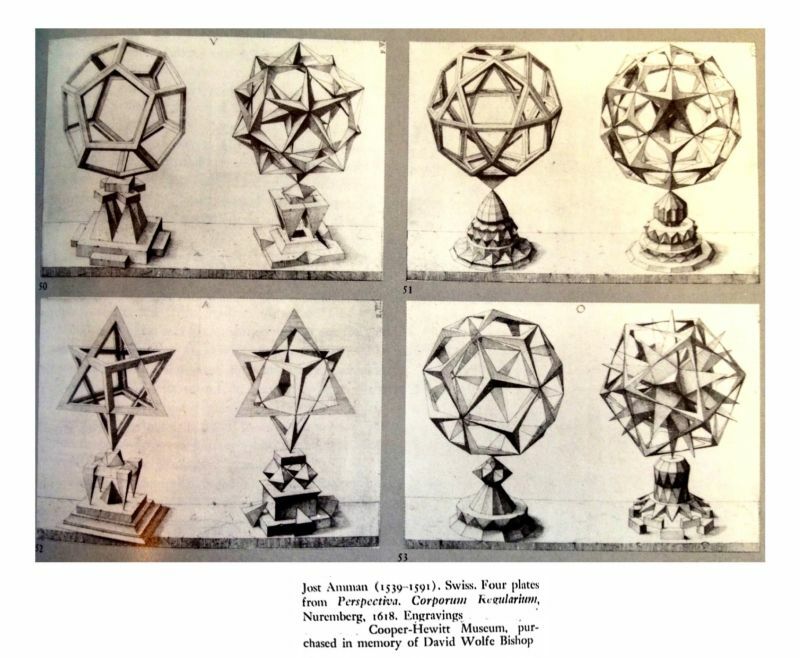 Can you find a connection between the reason regular polygons can form tessellations and the reason they can form the five platonic solids? 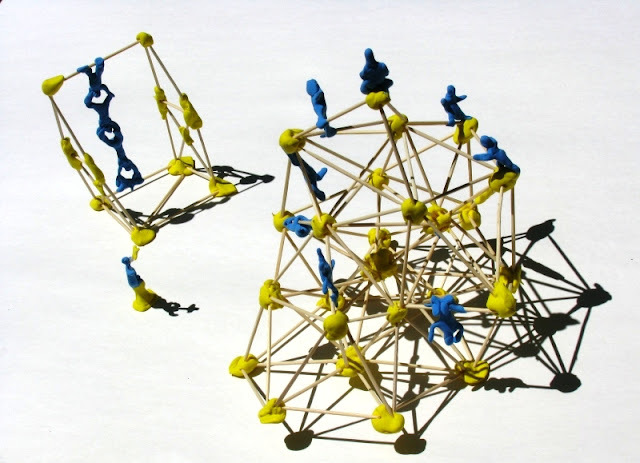 Model Magic, create a model of a tetrahedron. If you don't have Model Magic you can create your own clay, using white bread and ordinary white glue. To learn how to make home made clay, click here. Add three more toothpicks to form a second tetrahedron. Continue to add toothpicks, three at a time to build your structure. Create a tower consisting entirely of tetrahedrons. See how tall a tower you can build. For an additional challenge, make your tower symmetrically balanced. Build a toothpick city with your friends. Click here for some amazing toothpick city ideas. Click here to find out how you can enter a toothpick sculpture building contest. Have a bridge building contest. 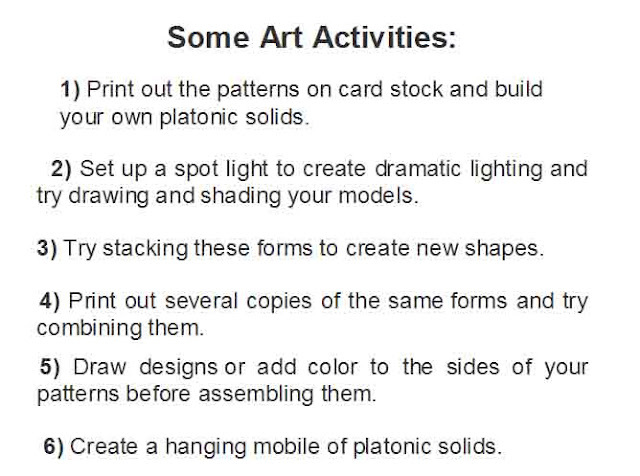 Click here and here for more information on bridge building in your classroom. Click here to download free bridge design software from West Point Military Academy. Click here for information on West Point's annual bridge design contest. To learn how to create a realistic drawing of a suspension bridge, using three-point perspective, click here. Watch this video to learn how one artist spent 35 years constructing a really cool toothpick sculpture of San Francisco. It all started when he was 8 years old and learned how to build toothpick sculptures in school. Where will your inspiration take you? Tatlin conceived of the idea for the tower after visiting Paris. He was inspired by seeing the Eiffel tower. "The Eiffel Tower, a 19th century iron lattice tower is one of the most recognizable structures in the world. It is the tallest building in Paris, and the single most visited paid monument in the world; millions of people ascend it every year. Named after its designer, engineer Gustave Eiffel, the tower was built as the entrance arch for the 1889 World's Fair. "* Can you find the triangular bracing that Gustave Eiffel used to make his structure more stable? Before the Eiffel Tower, architects and Engineers commonly hid the underlying structures of their buildings beneath wood or stone. When people first saw the Eiffel tower they thought it was ugly, like a building without any ‘skin’. Tatlin was also inspired by visiting Pablo Picasso in his studio in Paris. Once photography became widely available, artist no longer felt the need to faithfully copy nature. Instead they began to experiment and express their ideas in new ways. Many people thought Cubist pictures were ugly and did not like the new paintings. Something to think about: Decades before the invention of the modern computer (or video game) Pablo Picasso and Georges Braque began simplifying the human face into straight lines and geometric forms, in much the same way 3D computer animators do today. Does technology inspire art or does art inspire technology? The answer is; both. The two are inseparable. 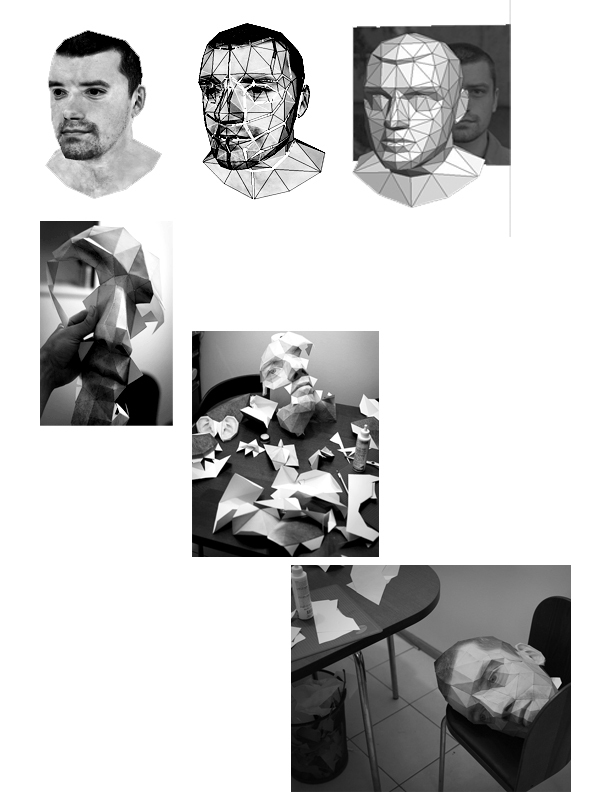 To see how one contemporary artist used modern wire frame technology to create this three dimensional cubist style paper head click here. 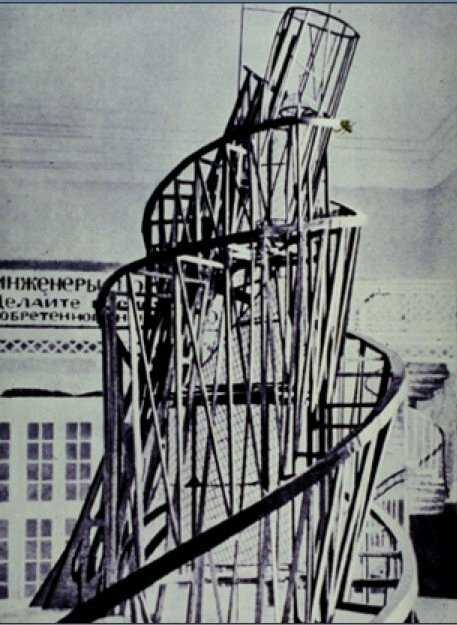 1) Why do you think Tatlin's tower was never built? 2) What made the Constructivists different from other sculptors? 3) Why do you think a building might be more stable if the designer used triangular braces? How can triangular bracing keep a building from collapsing? 4) Describe the Geometric forms that Tatlin was planning to place within the tower. What shapes did he choose and what were they supposed to symbolize? 5) Where did the Constructivists get their ideas from? 6) At the time when Vladimir Tatlin designed his monument, what building was the tallest building in the world? 7) How do you think Gustave Eiffel was able to create such a tall building without it collapsing? What technique was used by both Vladimir Tatlin and Gustave Eiffel? 8) How big would the Monument to the Third International have been, had it been built? 9) What do you think would happen if you tried to build a tall toothpick structure out of cubes instead of tetrahedrons? 10) Give some examples of how artists can get ideas from other people who came before them. You have a lot of amazing information - thank you! I teach middle school art and I am amazed at all you have put together - not sure where you find the time! I'm just having students create a toothpick sculpture for the first time with the model magic. I thought one of your set of instructions told them to make the clay balls and let them dry overnight before inserting the toothpicks. Is that correct? I would think it would have to be before the clay dried so I wanted to make sure. You wait until the model magic dries but then you dip each toothpick into white glue before inserting it. Works like a charm.